Singapore and China have a pact on constructing an urban city from scratch in China. This joint venture project will be comparable to the size of Pittsburgh and can accommodate 500,000 Chinese residents. This urban project is expected to provide jobs for Singaporeans and overseas workers to take part in building an economic hub that could compete with neighbouring cities. In 2018, Singapore was the biggest foreign investor in China. It has been recognized for the past six consecutive years, based on China’s trade ministry. Among the largest investments, one of them is the Sino-Singapore Guangzhou Knowledge City. This is a huge project that will transform farmlands into a sustainable urban development location. As this becomes a reality, this will become the new home of about half a million people. Such a 50-50 partnership is between Ascendas-Singbridge, a Singapore-government institution, and Guangzhou Development District Administrative Committee of China. According to CNBC earlier reports, the construction started five years ago. Currently, several half-built high-rise buildings are seen, along with silhouette cranes. 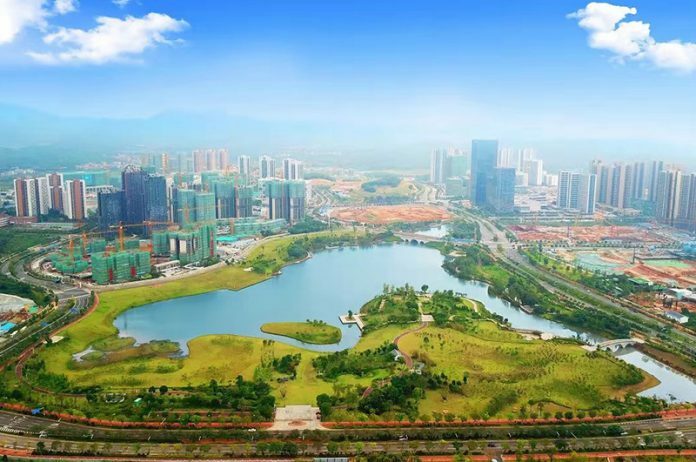 From Guangzhou, China’s third largest city, the new city can be reached by 45 minutes using a car and connected with a large rail network to Knowledge City’s upgraded trains. The initial phase of the urban city has begun. About 80,000 residents and working across the city have been benefited. It was built slightly over two square miles with 18 schools that will soon be constructed. Upon completion, the Knowledge City will have an area of almost 50 square miles or quite similar to the size of Pittsburgh City in Pennsylvania, United States. At present, farmers are being relocated to the high-rise buildings surrounding the area. Authorities seek new companies to provide them with jobs and administer retraining. Nee Pai Chee, vice president Singbridge International, noted that by making the farmlands into a modern city, both governments expect to build an economic hub for trade and research. Also, this model can be applied to rural locations within China and abroad. In a television interview with CNBC, Nee added, “Small is beauty.” He cited that the micro-level, Singapore has expertise in managing the mid-size and small-size cities and his team can share their experience in China. Knowledge City provides incentives like subsidies and free office spaces to Singaporean firms and others, such as Fortune 500 startup companies that can meet its guidelines. Also, the developers are willing to pay for public listing applications and IPO coaching and legal assistance. Both Singapore and China have a long history of partnership. Some of these were the 1994 Suzhou Industrial Park and the 2008 Tianjin Eco-City, which are currently running smoothly.